Lady Rogbut gra-Shurgak, an Orc noble, is the impetuous daughter of Lord Rugdumph gro-Shurgak, who has incurred the wrath of the local ogres. You will be asked to help her out while working for the Fighters Guild. She is a rather strong-headed and tomboyish woman with absolutely no desire to act the "lady" she was born and bred as. She wears a set of upper class clothing consisting of a black & burgundy outfit, a piece of jewelry, and a pair of gold trimmed shoes. She carries a spare green silk garment and a large amount of gold. During the Fighters Guild quest The Noble's Daughter, you will be tasked by Burz gro-Khash to rescue her. He'll start off by introducing her father: "He's an Orcish noble. A fine man. Our families go back a bit. Anyway, his daughter is missing. Head to his estate and talk to him. Find his daughter. And mind your manners! I don't want you embarassing [sic] me!" 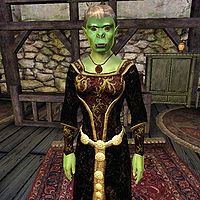 On the lady herself he cautions: "A fine model of an Orcish woman. Now go find her. And don't be rude, or she'll rip your ears off." When you arrive at the manor her father will be beside himself: "I fear that whilst out rock-picking, she was apprehensive. Stolen away! My suspension is that ogres have abjected her! I fear that whilst out rock-picking, she was apprehensive. Stolen away! My suspension is that ogres have abjected her!" He will then lament: "Please, rescue my daughter from those brutes! I fear for her safe return!" You will find the Lady wandering outside her father's estate, with three ogres tailing her as guards. Attempting to speak to her before all the ogres are killed will lead her to shout, "Don't just stand there -- get rid of those ogres! Stab them! Burn them! Tear their throats out!" After the ogres meet their demise, she will thank you with, "Glad you killed those things. I'd have done it myself, but apparently, that's not 'ladylike.' Hmmph. Let's get back to my father." If you try to talk to her again, she will sigh, "I suppose we should get back to my father. Time for me to be a noble again." She is evidently irritated at the prospect, as she will close the conversation with, "Please! Get on with it!" After the quest, she will be found in her father's residence at all times. Upon following you to her father and taking her leave of you there, she will greet you around the estate with, "Thanks for the help, not that I couldn't have taken care of it myself. If I were still allowed to carry an axe...." and close with "Let this be our little secret." You may hear her mutter, "Please don't tell anyone." and "This is so embarrassing." Complete the quest by returning to Burz gro-Khash at the Fighters Guild. He will seem quite pleased about the success of the mission, saying, "You got her back in one piece? Good work! I've always liked that girl. May have to look her up sometime. Here's your payment." Her father will be similarly happy, of course, and thank you in his own special way with, "You found my belabored daughter! I will tell Burz gro-Khash about your indentures! Take this. It has been passed in my family for many generators." After completing this quest, and before you complete Mystery at Harlun's Watch, you hear male Imperials commenting: "The Fighters Guild got Lady Rogbut out safe and sound. With the Blackwood Company, you never know....", "If Lord Rugdumph had used the Blackwood Company, who knows how it would have turned out. ", "If you wanted your daughter rescued, who would you hire? Blackwood Company? Not me. Can't trust them. ", and "Fighters Guild is still better for sensitive jobs, and you know it."